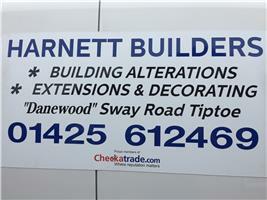 Harnett Builders - Builder based in Tiptoe, Hampshire. Welcome to the profile page of Harnett Builders. Thank you for making the time to visit my page and I hope you find it informative. My name is John and I established the company in 2005 but can offer over 30 years of experience in the building industry. I take a great deal of pride in my work and always push myself to deliver the best possible result. I work closely with my customers to make sure they are 100% happy with the work. I can offer a wide range of services, please visit my services page to see how I can help with your project.